I have two lovely little books to share with you this week. Firstly, On The Go! by Jess Stockham. This is a fab book for very young toddlers and babies because it’s really sturdy and chunky, perfect for those small but sometimes destructive little hands. 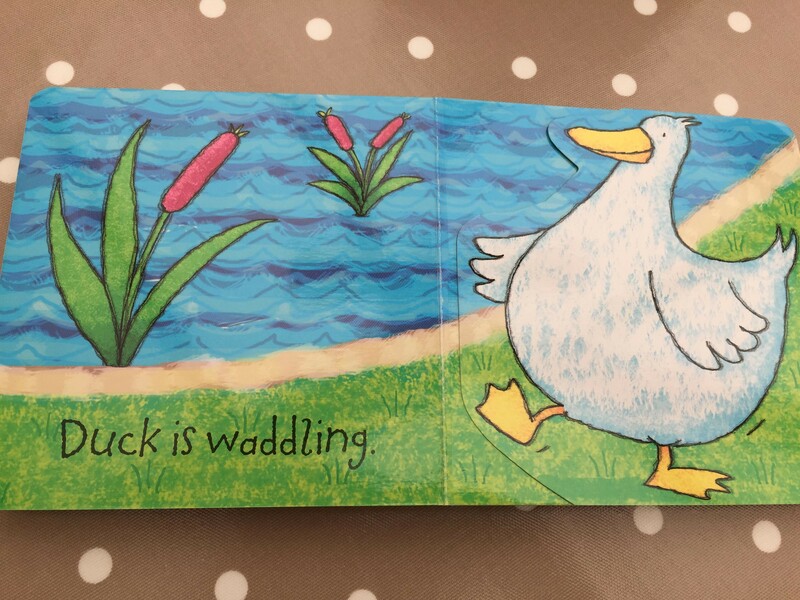 It would be especially good to share with your child when they are first learning to crawl or walk because each page shows a different creature crawling, stretching, jumping etc and then a flap to reveal a baby mimicking the movement. What child doesn’t love a flap book? And these are large and easy for young hands to lift up. The simple illustrations are bright and fun, and as well as teaching your child about actions and movements, it is great for naming colours and animals too. It’s the perfect size to slip into your changing back to keep your little one entertained when out and about, plus I think it would be a great book to include in a gift basket for a new mum. Our next book – Little Space Explorers by Anthony Lewis – is really fun and unique. It was the very first book Caterpillar grabbed from the bundle and it really fascinated him. It’s a concept I’d not come across before and is actually part of a series of books using the same format. Each page contains a pocket for your child to slide in the boy or girl cutout so that it appears the character is embedded in the page (I’m hoping the photos explain this better than I have!). Caterpillar was really engaged by this idea and loved taking the girl or boy character in and out of each page. It’s a great way for your child to interact with the illustrations. A really fab suggestion, that we haven’t tried yet, is to actually stick a picture of your child’s face on the removable part so they can be inside the story themselves! The educational narrative is informative and focuses more on teaching what each space-related item is used for, as opposed to an actual story, and if outer space isn’t your child’s thing you might be interested in others from the series – Little Jungle, Ocean or Snow Explorers. 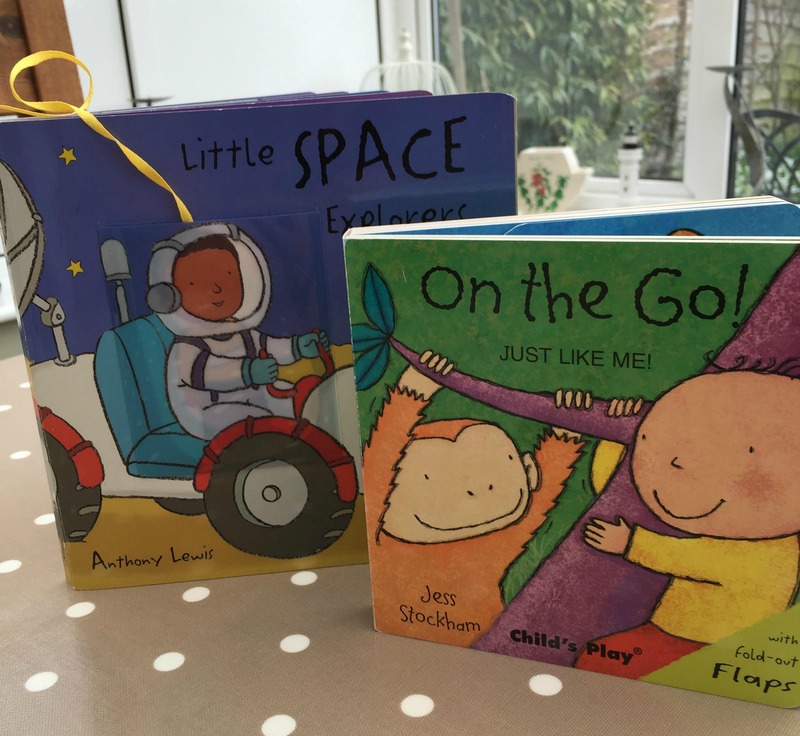 As with On The Go, Little Space Explorers is also really robust and a great idea for keeping your little one amused at a restaurant or in the car. You can buy both of these from Child’s Play Books. 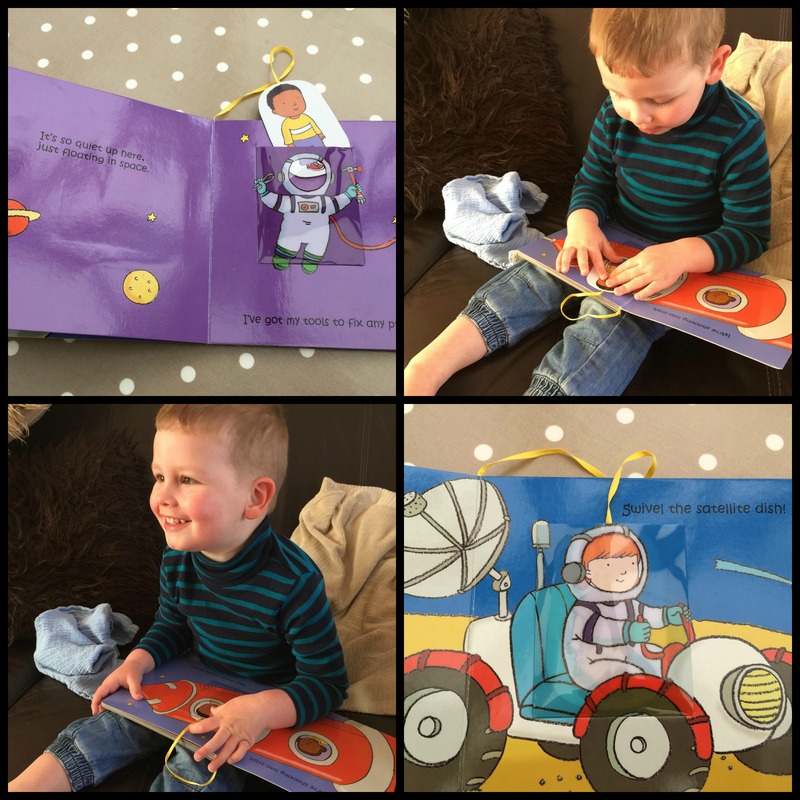 I love the moveable man in the space book and what a great idea to put a pic of your child’s face on it. We’re a bit obsessed with space here at the minute so definitely one for us to look for. What lovely books! My boys loved chunky board books when they were younger! I’m always on the look for new books and these two look great the space one with the character look amazing! A must buy for sure.